It all starts here…what starts as a hobby quickly grows into a passion. Our Toddler Gymnastics Class is a parent-tot class for walking toddlers through 3 years old. Together, you and your toddler will learn the fundamentals of movement, basic gymnastics body positions and skills using the gym’s fun filled movement stations specifically designed for your toddler. As you and your child go through each station with your group instructor, we will teach you proper spotting techniques and talk about movement goals. A group activity will conclude this fun parent-tot class. Our Pre-School Gymnastics Program is for children age 3 – 4. This class is designed for tots who are able to be in a class independent of their parents. Utilizing the same routine as our Toddler class, children will learn balance, coordination and strength while maneuvering through more challenging circuits. 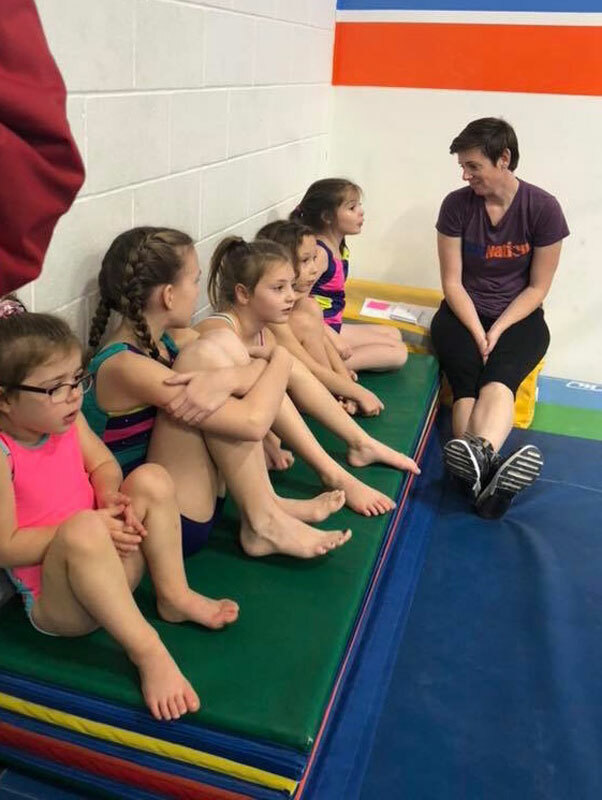 During this class we will go over various basic gymnastics movements and introduce organizational and social skills such as cooperation, listening and following directions. Our preschoolers have their own gym designed for little ones! Boys’ Junior Recreational Gymnastics is for children ages 5-6. This class is transitions children from the simple activities of the preschool program into more form-oriented gymnastics. This class will explore new challenges appropriate for this age group while social and organizational skill are still being reinforced. Proper gymnastic terminology will be introduced, and as children progress toward more difficult skills, safety guidelines will be incorporated. Girls’ Junior Recreational Gymnastics is for children ages 5-6. This class is transitions children from the simple activities of the preschool program into more form-oriented gymnastics. This class will explore new challenges appropriate for this age group while social and organizational skill are still being reinforced. Proper gymnastic terminology will be introduced, and as children progress toward more difficult skills, safety guidelines will be incorporated. Our Girls’ Recreational 1 class is for girls ages 6 and older. Students in this class will use regulation Olympic equipment and trampolines. Gymnastics skills will be developed using various drills as well as flexibility and conditioning techniques. 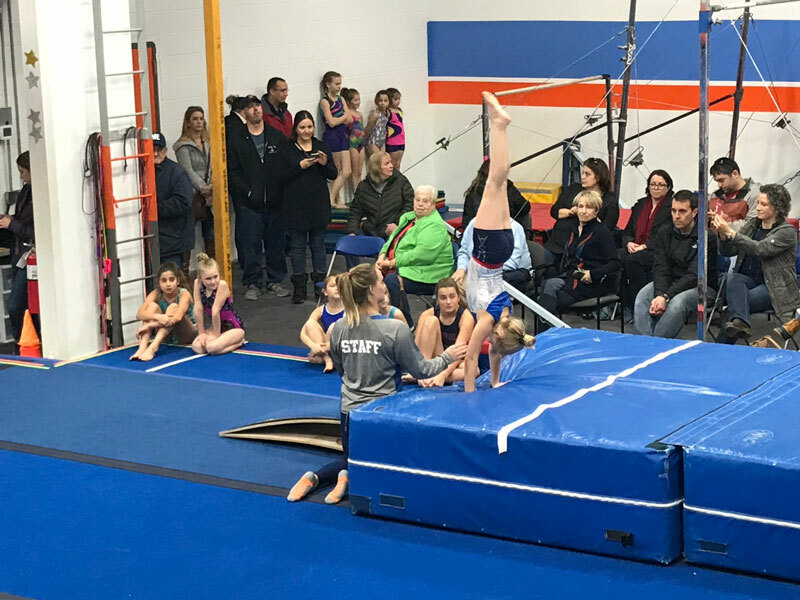 Gymnastics routines will be introduced and practiced with an opportunity to perform them for families and friends at our non-competitive recreational meets during the year. Our Girls’ Recreational 2 program is for the recreational gymnast who has progressed through the Girls Rec 1 program and is ready for new challenges in Olympic events and trampoline. There will be an emphasis on safety and fun as these gymnasts increase their skill level as well as opportunities to participate in non-competitive recreational meets. Girls’ Competitive Prep- (Invitation only) This class is for the gymnast who has demonstrated proficiency on all of the Olympic apparatus in either Rec 1 or Rec 2 and perhaps has an interest in the competitive team in the future. This is a faster-paced class that offers the opportunity to increase strength and flexibility and enhance their gymnastics skill level. 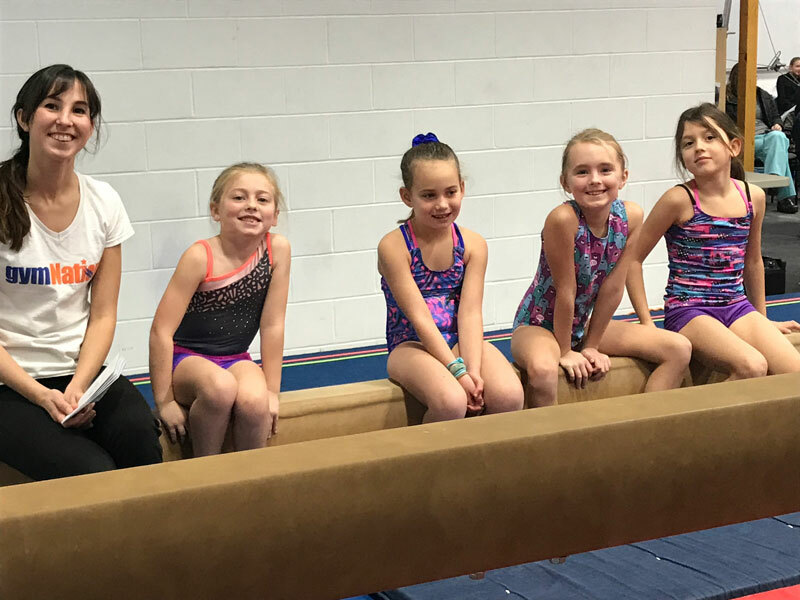 Gymnasts will be learning routines from the USA Gymnastics Junior Olympic program and will showcase them at the recreational meets during the year. Participation in this class must come by a coaches’ recommendation. Girls’ Pre-team- (Invitation only) This one hour class is designed for the 4 or 5 year old that has shown aptitude and a love for gymnastics in their Preschool or Jr Rec class and competitive gymnastics may be in their future. Good listening skills and focus are required. Coach recommendation required for participation. 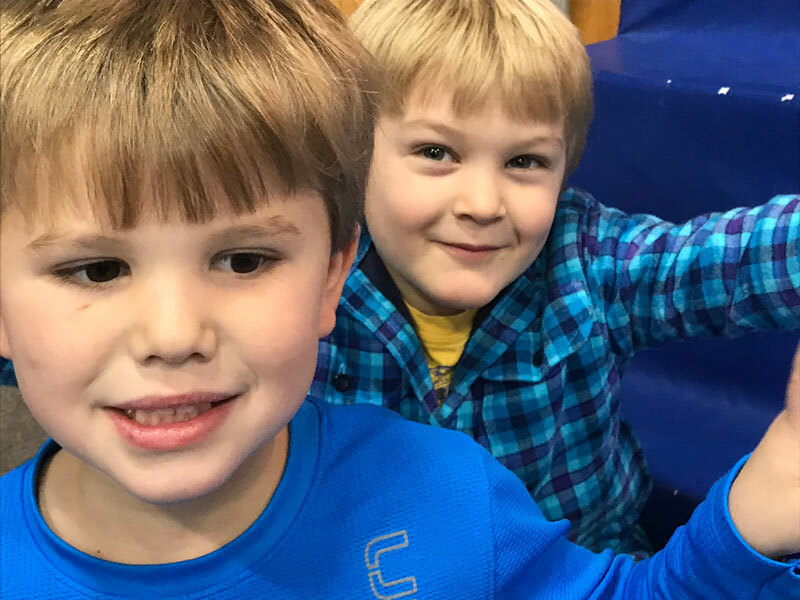 Our Boys’ Recreational Gymnastics class is for boys ages 5-7. This class is designed just for the male gymnasts who wants to have fun while developing strong bodies. Skills on bars, pommel horse, rings, vault, floor and trampoline will be developed using a safe methods in a positive learning environment. Through the use of games and circuits boys will become strong and flexible awhile improving their cardiovascular fitness. This class is beneficial for athletes involved in any other sport. This is a great class for preschool students to participate in learning gymnastics. This is a great class for home school families to participate in learning gymnastics. Focus in this class will be on learning the fundamentals of tumbling which will include rolls, handstands, cartwheels and round offs. Front and back handspring progressions will be introduced as the basics are mastered. Trampoline and Tumble trak will be used along with spring floor in the training. “Drop In” Tumbling- This tumbling class is designed for the “busy” athlete who may be involved in cheering or other performance sports. Our coaches will individualize participants needs according to their goals and ability levels. Skill progression, strength and flexibility will be the focus while training on the spring floor, trampoline and tumble trak. All gymNation tumbling coaches possess strong spotting techniques to aid in training. To find out more about our programs, fill out the form below.